Of course wine geeks get excited about the Niagara region: the peninsula is scattered with nearly 100 wineries, with doubtless more on the way. Once you drive a little ways beyond the gaudy Niagara Falls Clifton Hill area, the buildings get smaller and fewer, and the most common view out the car window becomes rows and rows of grape vines. As one of the best sources for Icewine in Canada, it’s no surprise that wine tours are constantly happening in Niagara, nor is it uncommon for many a wine enthusiast to spend a weekend or more exploring the fine establishments to be found there. But what about those travelling with a wine enthusiast? What is a beer drinker to do on the Niagara Peninsula? Thankfully, lots. 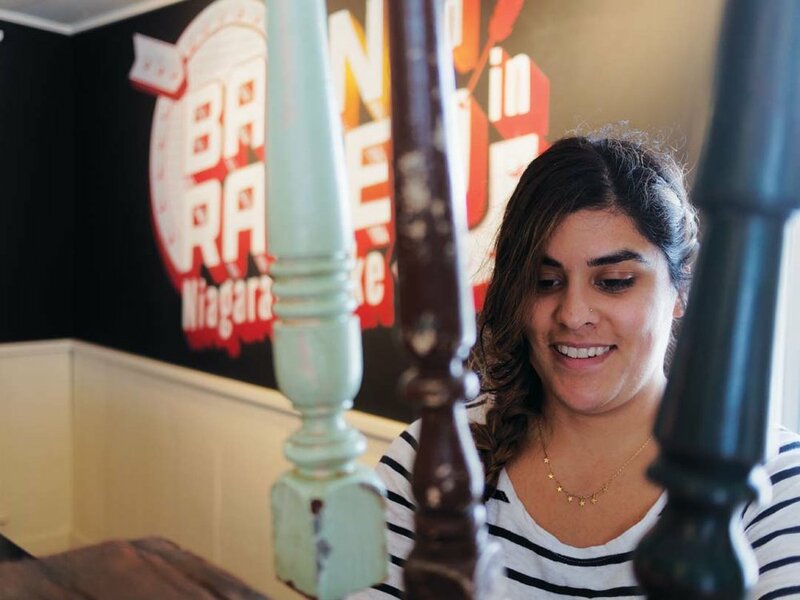 While Niagara boasts nowhere near as many breweries as wineries, the two local industries are bonded by the same passion for quality and complexity while featuring the welcoming aesthetic the region is known for. The peninsula is home to many who opt to leave the wine, but take the barrel for some interesting aging projects. Of note are three such breweries that are near enough to the vineyards that you can sneak away from a wine tour to visit them, and are of a high enough calibre that you needn’t feel any less classy or refined. The natural first stop, and the one least likely to offend the sensibilities of any wine drinkers you might be with, is Niagara Oast House Brewers. 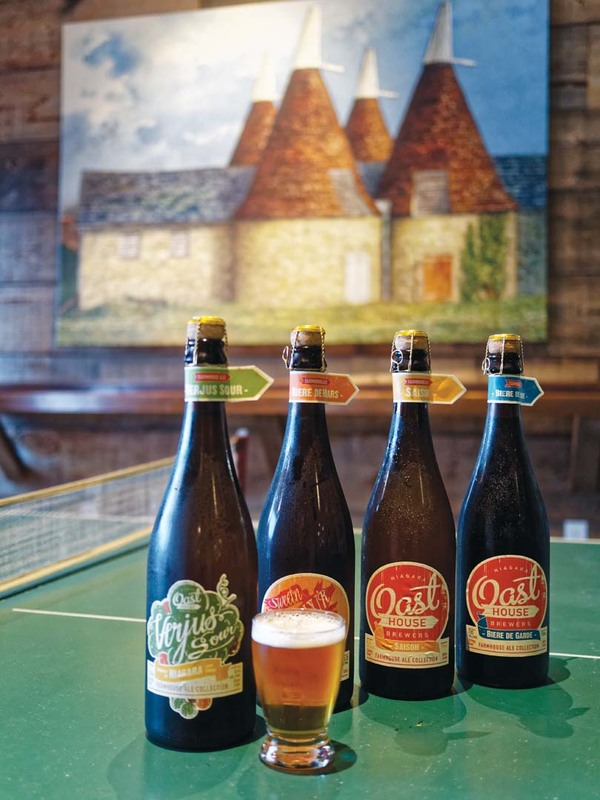 Located in a bright red barn among vineyards on Niagara Stone Road, Oast House originally opened in 2012 and immediately put a focus on farmhouse-style ales, leaving plenty of room for experimentation in recipes, bottle conditioning and barrel-aging. Their year-round offerings include a bottle-conditioned Saison with flavours of herbs and bright lemon, an earthy Bière du Garde with hints of dried berry, and Barnraiser, an American Pale Ale with notes of grapefruit and peach. Seasonal and experimental beers include anything from a Belgian Wit to a unique take on a Dutch Koyt. To accompany their delicious beer is mouth-watering food brought forth by two chefs with two different approaches. Chef Adam Hynam-Smith and his team at El Gastronomo Vagabundo provide dishes on Friday evenings and Saturdays during the day, and take their inspiration from street food found in all parts of the globe, from Korean BBQ burgers to fish tacos. Chef Charlie Clowes of the Ello Gov’na food truck, stopping by on Sundays, strives to create modern fusion takes on British cuisine like a spicy Chinese-style scotch egg, while also serving longstanding English favourites like pasties. Top off excellent beer and food with the gorgeously rustic venue, which includes a spacious taproom, luxurious patio, and a breathtaking upstairs event space that overlooks a field of grape vines, and you have one amazing Niagara beer experience. Just down the road you’ll find, in the small community of Virgil, one of the early breweries on the small-town Ontario scene and, as it so happens, a fantastic stop for a short lunch and a flight. Those familiar with Silversmith Brewing may only know it for its flagship beer, a black lager that has been making the rounds through bars consistently since 2011. But going direct to the brewery, itself a beautifully converted century-old church, you’ll find a larger selection of beers that show they’re so much more than a one trick pony. Longstanding favourites include the Bavarian Breakfast Wheat, with hints of banana, clove, and graham cracker, the Hill 145 Golden Ale, with flavours of apple and peach, with a lovely malt backing and a slight bitter note, and the ever-popular seasonal Tide & Vine Oyster Stout, a collaboration with the brewery’s food partners Tide & Vine. While the many varieties of oysters with house-made sauces are a fan favourite, the biggest hit is the Po’ Boy of the Month. Finally, right in the heart of downtown Niagara-on-the-Lake is one of the region’s most talked about brewpubs, The Exchange Brewery. Exchange, taking its name from the telephone exchange that the building once housed, was recently named Canadian Brewery of the Year at the New York International Beer Competition, and for good reason. This modern space features a number of elements, from its unique interior with a telephonic theme to its modest menu of food, that make it stand out. However, all of those things are secondary when compared to the creative efforts of Head Brewer Sam Maxbauer, who brings experience from his previous job at the famous Jolly Pumpkin Artisan Ales in Michigan to the table, creating a wide range of beers that entice the palate and excite the imagination. Beers such as their Witbier, aged in Hungarian oak and featuring heavy orange notes, and a delightfully sour Flanders Red Ale aged in local red wine barrels, are an excellent indicator of the level of talent held at Exchange, from the brewing side right down to the folks involved in their barrel-aging program. uch like the Niagara Peninsula, the Okanagan Valley in British Columbia (Canada’s second largest wine region, with 8,619 acres of planted vineyards) has been an attraction for wine lovers for over twenty years. Luckily the Valley has its own emerging craft beer scene, as passionate as those in Prince Edward County and the Niagara Peninsula, and as much a proud part of the local culture. Starting just north of the border between the United States and Canada –with no wall in sight yet – your first chance to carve out space for a good pint of craft beer in your wine-heavy itinerary is in Oliver, British Columbia. The highway signs exclaim that you’re entering the “Wine Capital of Canada,” but fear not. Among all those vineyards and wineries, you can extinguish your thirst for beer at the Firehall Brewery, run by a local musician named Sid who started home brewing in his dorm room at university and has never looked back. The Firehall’s downstairs Beer Shop & Social tasting room offers draught beer, snacks, board games, and regular events. The brewery also hosts a series of Back Alley concerts in the warmer months. As you make your way into the Valley, through White Lake Grasslands and Vaseux protected areas, and along the west side of Skaha lake, you’ll find Penticton, nestled at the bottom of Lake Okanagan. Penticton is home to the oldest brewery in the region: Tin Whistle Brewery, which opened there in 1995, the same year as the birth of the Okanagan Fest of Ale, an annual two-day festival in early April. Since 1995 Penticton’s beer scene has expanded to boast four breweries and a quaint brewpub called the Barley Mill. Cannery Brewing, which opened in 2000, has recently moved into a new downtown location with a popular tasting room. Nearby is Bad Tattoo Brewing, opened in 2014. Its custom-built facility within sight of the beach includes a popular pizza restaurant and a solid range of beers. Filling out the scene in Penticton with Tin Whistle, which moved into Cannery’s original location in the Cannery Trade Centre, is the newest arrival, Highway 97 Brewing, which took over Tin Whistle’s original building when it moved out. Heading further north towards Kelowna, you’ll find one of the Okanagan’s newest breweries in Summerland, about 15 minutes north of Penticton. A small operation, the very newly opened upstart Detonate Brewing is only open Fridays and Saturdays. If you’re not in town on a Friday or Saturday, your next craft beer stop lies 35 minutes north in the beautiful city of Kelowna. Head north on BC Highway 97, and make sure your navigator keeps an eye on Lake Okanagan, in case of a sea-serpent sighting. Tree Brewing started the Kelowna craft beer revolution in 1996, and was joined by Freddy’s Brewpub five years later. It took some time for another microbrewery to join the scene: a second operation run by Tree called the Tree Beer Institute, housed downtown right next to Waterfront Park where the annual Great Okanagan Beer Festival has been taking place every June since 2015. Now, twenty years later, Kelowna is home to several other breweries: BNA Brewing, named for the historic BNA Tobacco building in which the gorgeous restaurant/brewery is located; Kettle River Brewing, just around the corner from Tree; and Boundary Brewing, closer to the airport to the north of the city. Two more breweries are slated to join the scene very soon: Red Bird Brewing will open across the street from Tree, and another operation is in the works across the floating bridge in West Kelowna. Vernon, BC, a 45-minute drive north of Kelowna, past McKinley Landing, Pixie Beach, and Kalamalka Lake, is the northernmost point of our Okanagan Valley Wine-turned-Beer Tour. Vernon is the home of the Okanagan Spring Brewery, which was one of the early leaders of BC’s craft beer movement in the 1980s and 1990s. Okanagan Spring Brewery eventually ceded its status as an independent brewery when it was bought by Sleeman Breweries and then, ultimately, Sapporo Brewing. Happily, craft beer returned to Vernon in 2015 when the Marten Brewpub opened downtown at 30th and 30th next to the Naked Pig BBQ Smokehouse, which is also run by Stefan and Pearl Marten. As you may have suspected, Canada’s most popular wine-producing regions have created tourist-fuelled havens that nurture more than just the vintners whose initial undertakings created the scenes. Just as any developing art scene becomes its own catalyst for creation, innovation, and culture, the wine counties of Canada are, and will continue to be, hotbeds for people who are committed to creativity and quality in craft brewing.